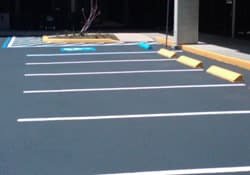 In order to help prevent cars or trucks from hitting buildings, signs, other parked vehicles, and driving up onto a sidewalk area, parking lots need concrete parking bumpers or car stops. They allow you to demarcate your parking spaces easily and help cars & trucks stop exactly where they should without damaging their wheels. Duraseal is the Philadelphia/Camden car stop expert, installing car stops for all size properties in New Jersey, Pennsylvania and Delaware. Car stops come in different sizes, six feet long being the normal size for parking stalls. They can also come in different heights where a larger bumper for truck and trailer parking is required. The concrete bumpers are installed using the 2 holes installed at each end of the bumper so that a 1/2″ rebar can be inserted for anchoring to asphalt or concrete surfaces. Concrete bumpers can also have drainage cuts to allow water to pass through. Car stops also come in heavy duty rubber made from composite recycled materials and highly reflective colors. They are highly visible and durable and do not crack or chip. Contact us for your concrete bumpers & rubber car stops needs in the Philadelphia and Camden area.